Today is World Milk Day and what better way to celebrate the natural goodness of milk than by Giving a Mate 8. Why 8? That’s the number of nutrients naturally found in milks like Dairy Farmers, Pura and Masters. Lion Dairy & Drinks (LDD), who owns and manufactures the Dairy Farmers, Pura and Masters brands believes World Milk Day is a great time to remind all Australians of the natural goodness of milk. “I reckon we all have a mate who, at some stage during the day, could use some B vitamins when feeling flat, protein for their muscles, or iodine for the brain as part of a balanced diet,” said Darryn Wallace, Lion Dairy & Drinks’ Marketing & Innovation Director. Darryn says many of us may have forgotten how nutritious milk is and the goodness it brings to all the dairy foods we love. “And while most of us know milk is good for us, it’s not a conscious source of nutrition,” he said. Nine out of 10 Australians don’t consume their recommended daily serves of dairy or alternatives as shown by the Australian Health Survey. 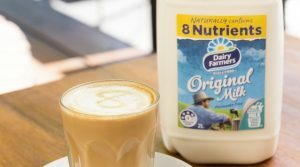 “Give a Mate 8 this World Milk Day is a great way to celebrate the inherent goodness of milk,” Darryn added. Last year LDD launched its Milk Loves You Back campaign to remind Australians of the natural goodness of milk. At the time it also released a study showing almost a quarter (21%) of women and 15% of men admitted that their main source of daily dairy was derived from coffee with milk alone. “This is the perfect opportunity for all Aussies to reawaken their daily consumption of milk and dairy products,” Darryn said. Consume as part of a balanced diet. The new M2GO drinks are available nationwide in two flavours – strawberry and chocolate. With the Milk Loves You Back front of pack logo calling out the inherent benefits of milk – as well as naturally occurring protein and potassium for hydration – within each carton, M2GO is bound to be a lunchbox favourite for both children and parents. Consume as part of a healthy balanced diet.